After wooing Hyderabadis, the legendary Bade Miyan Kebabs has now made a grand entry into Bangalore’s glorious food scene. Biryani, kebabs, and haleem are on the menu! Turn back time and step into the Hyderabad of the 1930s. Venture into its historic streets and you’ll bump into the budding Ismail Hotel, drawing in customers with typical Hyderabadi fare. Close to a century later, the humble hotel has been spruced up with snazzy branding and been presented to us, the denizens of Bangalore. Bade Miyan Kebabs might be a mall fixture (they are at Orion Malleswaram and will soon open shop at the Banaswadi Orion too) but it sure does pack a punch. Much of the regular menu is made up of biryani platters and roti-kebab combos. We tried the Bade Miyan ki Biryani & Kebab Platter. This one can easily be shared by two healthy eaters. We tucked into heapfuls of Hyderabadi biryani that came with just a hint of spice and grease. The Murgh Malai Kebab was slightly charred on the outside and juicy on the inside. The only let down was the Pathar Ka Gosht that lacked the fattiness and hence the rich flavour that is the hallmark of the traditional dish. In the spirit of Eid, we recommend you begin with their silken Chicken Haleem (sadly they don’t offer the mutton variety). However, all disappoint vanishes with a slurp of the silken, slightly gooey mixture that’s infused with plenty of aromatic spices. 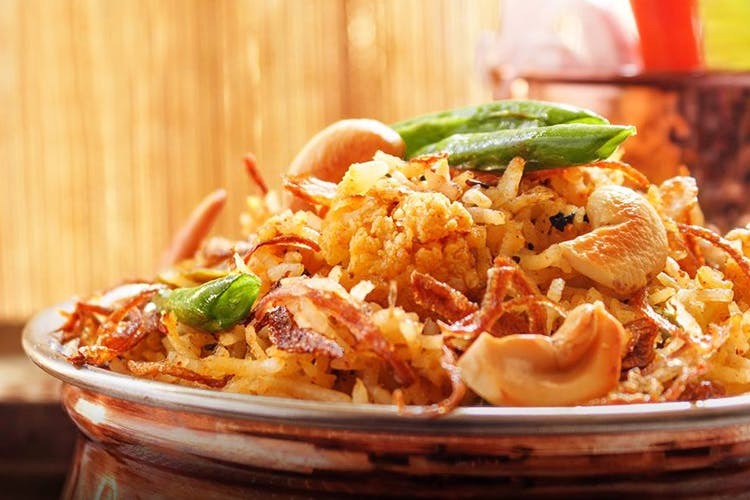 The sweetness of the deep fried, golden-brown onions sprinkled on top is a delicious touch.